The beauty of the concept is that nobody really has a clue about what it is all about. You can read the Wikipedia entry as many times as you like, and still not gain a clear picture of what Bitcoin is, and what it does. But why would you want to know such boring details? All anyone has to know is that its price is going higher and higher. Plus, of course, there is the opportunity to laugh at stories of people who bought Bitcoins, but then lost the code – for an excellent example by a former editor of WIRED (with a happy ending), click here. And, of course, interest is growing all the time as people rush to get rich. Today sees the start of Bitcoin futures trading on the CME, a week after they began on the CBOE and CME. Bloomberg suggests Exchange Traded Funds based on Bitcoin will be next. In turn, these developments create more and more demand, and push prices ever-higher. Comparisons have been made with the Dutch tulip mania in 1836-7, when prices peaked at 5200 guilders. At that time, Rembrandt’s famous Night Watch painting was being sold for 1600 guilders, and at its peak a tulip bulb would have bought 156000lbs of bread. Bitcoin probably won’t equal this ratio until next year, if its current price climb continues. Of course, one key difference between tulips and Bitcoin is supposedly that there were always more tulips to buy – whilst there are just 21 million Bitcoins available to be mined. 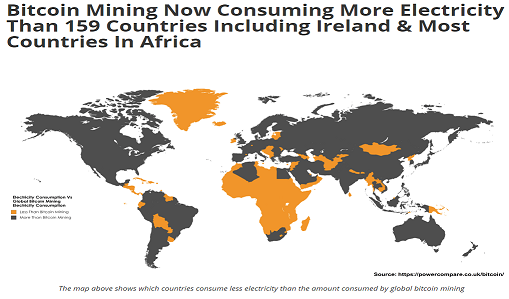 And apparently, around 80% of these have been mined. Bitcoin enthusiasts therefore suggest Bitcoins will have increasing scarcity value. But, of course, anyone can create a crypto-currency and many people have – such as Bitcoin Cash and Bitcoin Gold, and the Ethereum family. Nor is it a method of settling transactions, as its value is increasing all the time – obviously a good deal for the person who receives the Bitcoin when its price is rising, but why would any sensible person pay with a Bitcoin? The “story” behind its boom is also powerful because it is linked to the great investment theme of our time, the internet. We have all seen the fortunes that can be made by investing in companies such as Apple. Now, Bitcoin supposedly offers us the chance to invest in the Next Big Thing – a new currency, entirely based on the internet. 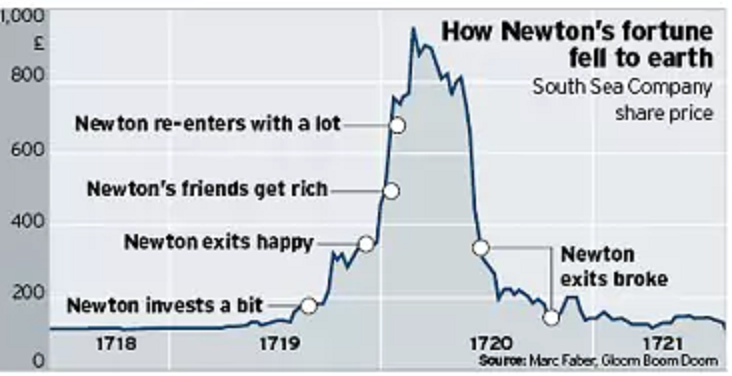 The Bitcoin mania has many parallels, such as with the South Sea Bubble from 1719 – 1720. Its power was also based on “the greater fool theory”, and its linkage to the great investment theme of its time – the opening up of foreign trade. 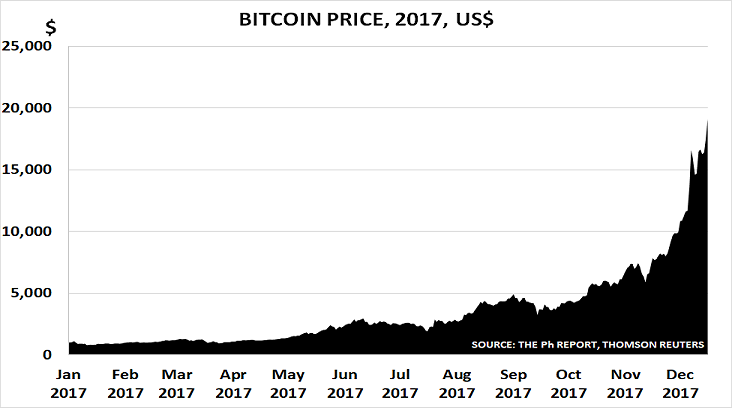 As the chart from Marc Faber shows, one of its early investors was Sir Isaac Newton – one of the most intelligent people ever to live on the planet, who discovered Newton’s laws of motion and invented calculus. Newton doubled his money very quickly when he first invested, but then re-invested at a higher price – and lost the lot. Of course, all the dreams associated with Bitcoin and the other crypto-currencies may come true. That is part of their attraction. Another part of their attraction is for criminals, who can launder money without being traced. So most likely, prices will continue rising for some time as more and more people around the world see a chance of getting rich very quickly. We have never seen a global mania before, so nobody can tell how long it will last. But by letting the mania continue, the potential impact from its collapse will increase. 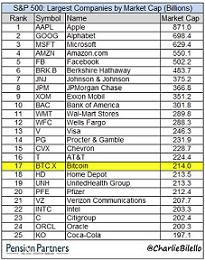 Added together, crypto-currencies already have the same market cap as Facebook – and could soon overtake Apple to become the most valuable “stock” in the world. Yet unlike Apple, they have no sales, no income and no assets. Bernanke and the major central banks wanted to stimulate investors’ “animal spirits”, so that they would take on more and more risk. 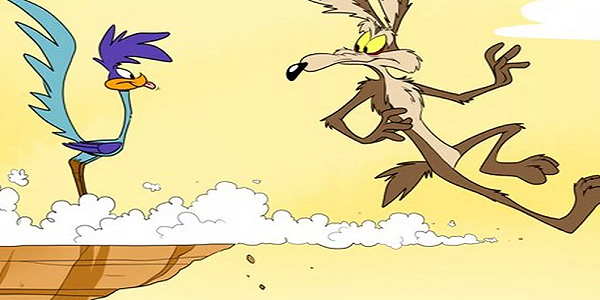 Crypto-currencies are therefore the logical end result of their post-crisis strategy. The end of the Bitcoin mania, whenever it occurs, will therefore also mark the end of stimulus policies.